It was a December night in 1545, the magnificent new Library under construction in Saint Mark’s Square had reached the fifth/sixth bay, when a large part of the barrel vault of the large reading room suddenly collapsed. 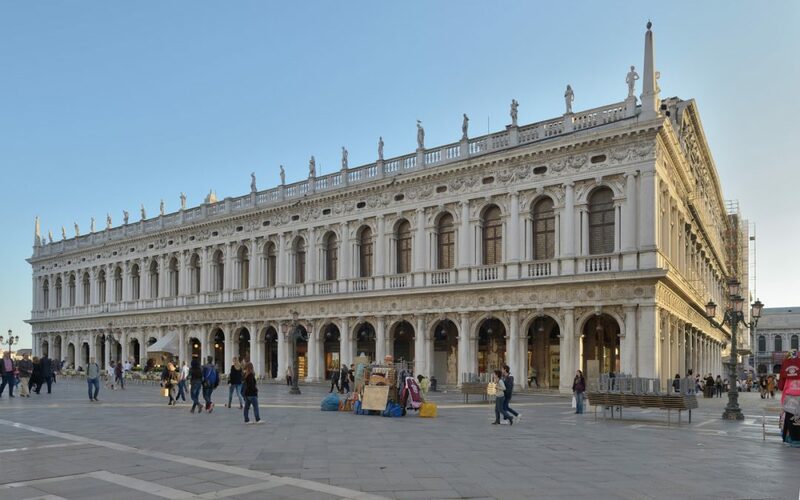 In the mind of doge Andrea Gritti the Library was meant to transform the medieval Saint Mark’s Square into something completely new: a magnificent forum as in ancient Rome and Athens. Why a library? 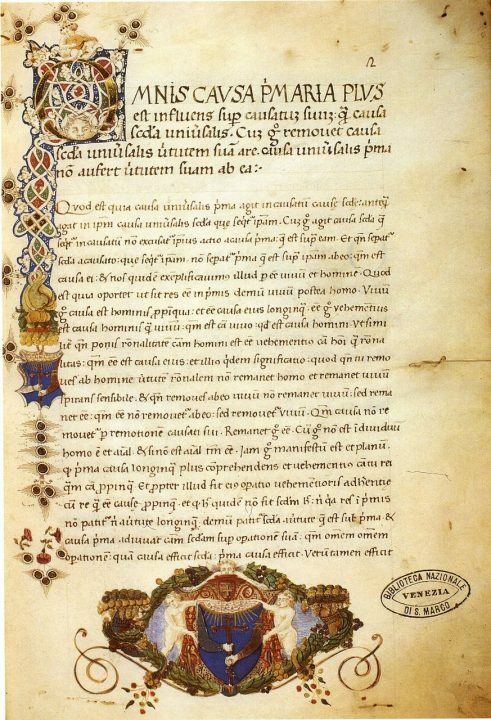 Because Venice had the books, a large number of books of great value: they were part of the collection of Greek and Latin manuscripts which in 1468 Cardinal Bessarion had bequeathed to Saint Mark’s church on one condition: they had to be preserved in Saint Mark’s Square. 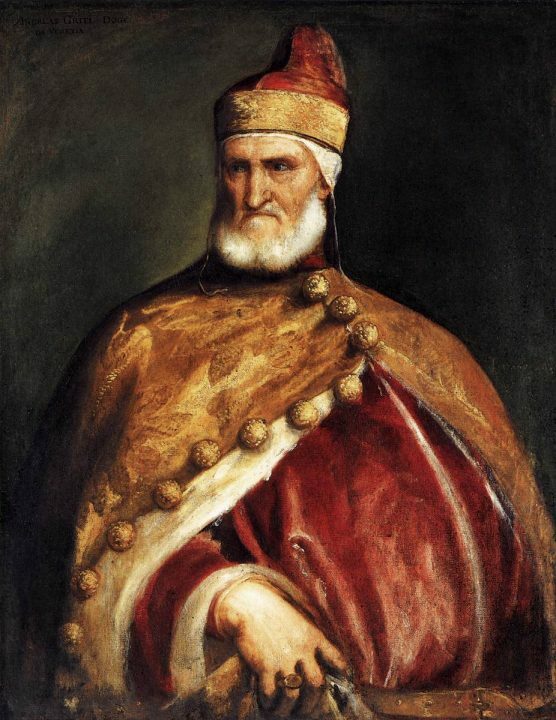 At first the collection was accomodated in the Doge’s Palace, however in 1515 the Senate of the Most Serene Republic decreed that they were to be granted a more suitable place. 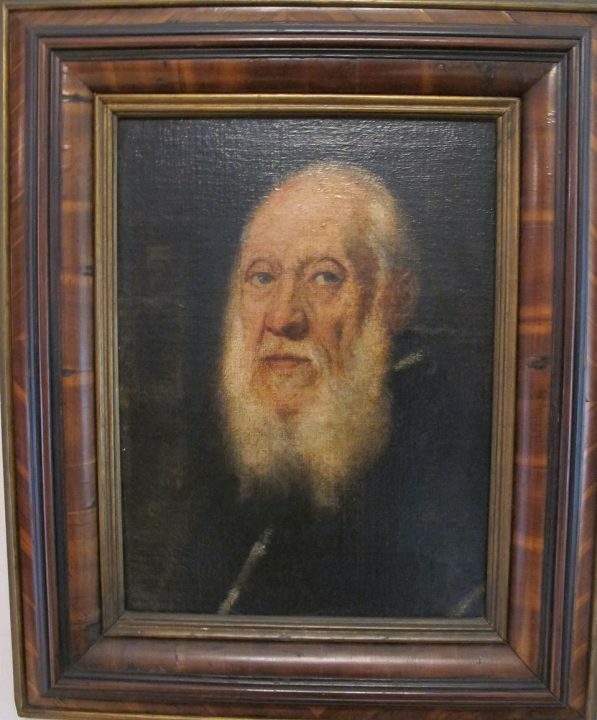 The Procurators of St. Mark’s had been entrusted with the custody of the books, in fact one of their institutional duties was the custody of everything belonging to Saint Mark’s Church. 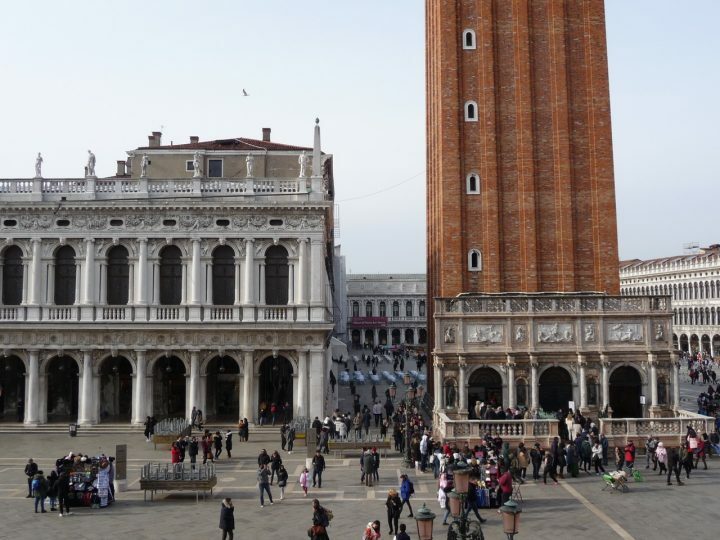 The Procurators were also responsible for the administration of all estates and properties in Saint Mark’s Square they let, so as secure the income for the needs of Saint Mark’s church restoration, maintenance, the expenses for the choir etc. In 1515 the Senate decree came as a bolt from the blue for the Procurators, who were to be put more and more under pressure: not only did they have to find a suitable place for the books, this had to be a magnificent one! Furthermore, not only would they loose the income coming from pre-existent spaces they owned, they were actually forced to convey part of the income belonging to Saint Mark’s to fund the construction of the Library, something which had nothing to do with the needs of the church! Some of them were thrilled about the project, but others felt as if they were betraying Saint Mark. 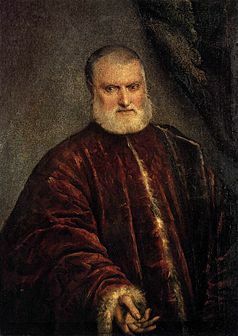 When the architect Jacopo Sansovino arrived in Venice from Rome, proud of his knowledge of ancient Roman architecture, even the doge himself started to put pressure on the Procurators who eventually had to throw in the sponge. 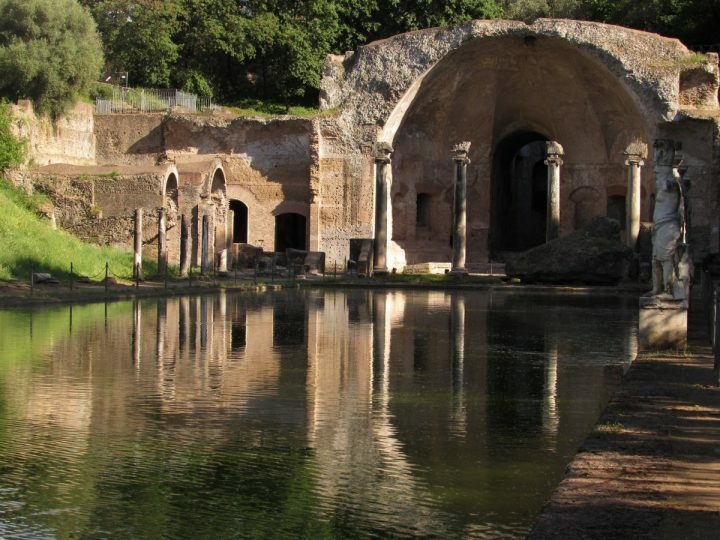 Sansovino chose as a model the Basilica Emilia, an ancient roman building which he had studied thouroughly and frequently drawn during his Roman stay. 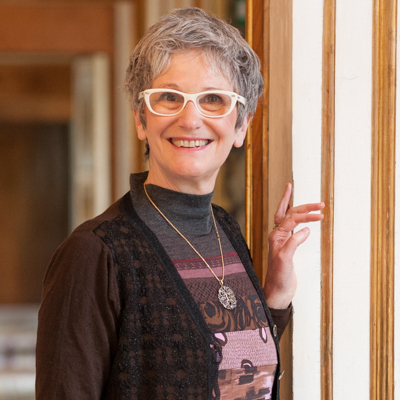 Why the Basilica Emilia? We can assume because of its magnificence, but also because the custody of manuscripts required specific measures in case of fire.Venice, the city built on mud, had developed a building practice based on lightness and cost-effectiveness: thin walls, wooden floors, wooden trusses for the roofs, which could obviously fall easy prey to fire. On the other hand, the ancient Romans had developed great and wide architectural structures, with big brick vaults. The problem was the thrust, and this is the reason for the thickness of roman walls. Such buildings were of course incredibly expensive, but money was no problem at all in Rome, which could drain immense treasures from its entire and huge Empire. Venice was also a wealthy city, of course it was, but its wealth was not even to be compared to the one of ancient Rome. Here, building all’antica in the 16th C meant having to deal with narrow spaces within a thick and intricate urban fabric, soft ground as well as trying to keep costs down. Sansovino started the construction from the corner at the side of the bell tower: he laid strong oak foundations and started off the barrel vault, which was meant to cover a hall 11 meters wide (36,09 ft). And what about the thrust? The Library was an isolated building, there was nothing which could work as a buttress there, and Sansovino’s walls were thin: their thickness was just 1/14 of the width of the hall. According to rules in use in 16th C, that was enough to hold wooden trusses, but not a vault, and everybody knew that! And Sansovino knew it as well, of course he did, he was not incompetent or inexperienced. 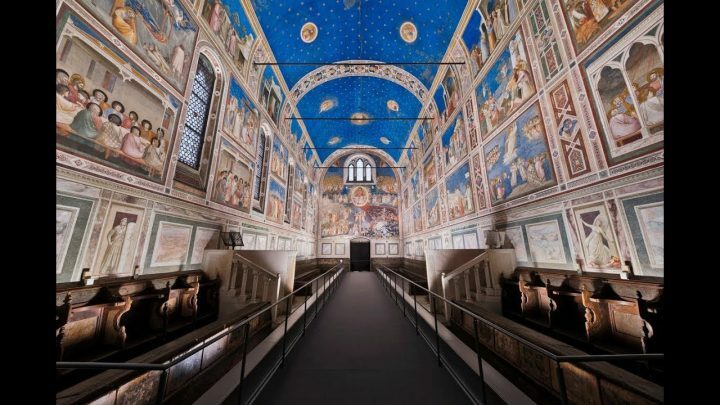 Barrel vaults – even if narrower than Sansovino’s one – had been sometimes built also in the Middle Ages, for example in the Scrovegni Chapel in Padua; to hold the thrust then, they made use of iron bars, and it was this very solution to inspire Sansovino as well, yet with a substantial difference. 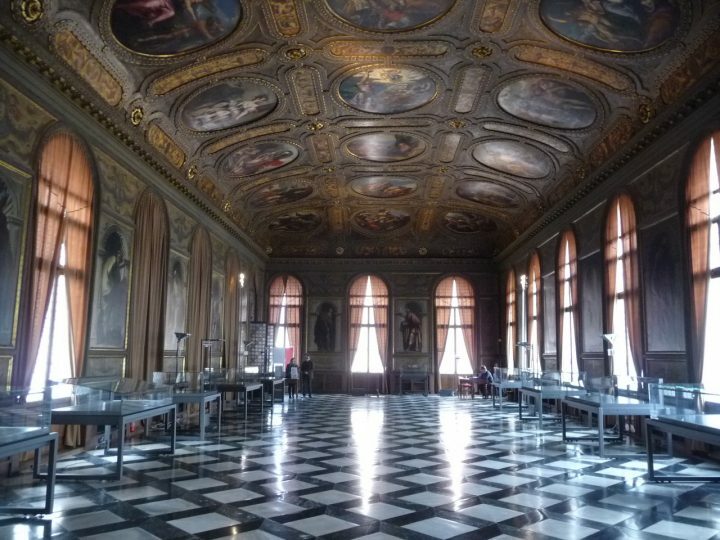 The reading hall of the Library was meant to be richly decorated, and Sansovino thought that the presence of so many iron bars across the ceiling may have affected the beauty and impact of the whole space; last but not least, the Romans had never used iron bars. Bold and daring as he was, Sansovino conceived therefore an invisible system of bars within the masonry of the vault. How do we know that, since the vault collapsed? There is some evidence of that, such as the presence of similar bars inside the porch of the Library. It was an expedient, a compromise to succeed and recreate the magnificence of ancient Rome, without busting the budget, and unfortunately it proved to be totally ineffective: the vault eventually did collapse. Sansovino was convicted to rebuild the roof at his own expenses, no more a vault, in fact simple wooden trusses following the old Venetian tradition. What can one say about this? Was Sansovino incompetent? Of course not, absolutely not! His attempt was a great technological experiment. It is easy nowadays to understand that those inside bars could really be useless, but it was different in Sansovino’s times. It was only in the 19th C that a new technology was developed so as to solve this kind of problems. Poor Sansovino had to learn a hard lesson and, from that moment on, he had to realize that- as his friend Pietro Aretino had happened to write – “ the clothes of ancient architectures don’t suit the backs of the modern ones”. Giulio Lupo, il “risparmio di spesa” nelle vicende costruttive della Libreria marciana, in “Annali di architettura”, 30, 2018 forthcoming. Manfredo Tafuri, Ricerca del Rinascimento, Einaudi 1992, in particolare l’Epilogo lagunare. Jacopo Sansovino dall’inventio alla consuetudo.